Who’s going to come cheer us on at CRASH-B 2015? It takes place this Sunday, February 28th at Boston Universities Agganis Arena. If you’re competing, today is a great day to practice you race warmup and a few starts. Get pumped, race day is coming! Game Faces are on! Bring on that 2k! In today’s Rowing WOD really focus on good connection and suspension with the legs. In this workout you will perform the work as follows: complete 12 calories on the erg, then 12 box jumps, then 12 push ups, then 10 calories, 10 box jumps, 10 push ups, … and so on. Coming off the push ups your arms may be feeling it so work for efficiency and power with the legs on the erg. Also, be sure to strive for virtuosity and complete each rep of the box jumps and push ups according to the standards of performance. For box jumps you’re hips must be fully open above the box and for push ups your chest must touch the ground. For maximum fun grab a partner and have a High Noon Showdown! Who can make it to the end first? 3-2-1 Go! 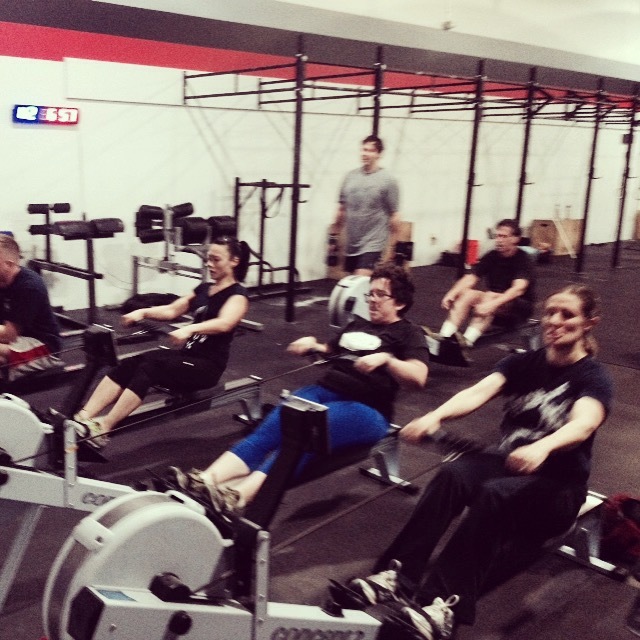 This entry was posted in Rowing and tagged endurance sports, exercise, functional movements, new sport, personal experiences, recruitment patterns, row 2k, rowing, sports, Strength, training by Renegade Rowing. Bookmark the permalink.